Part of the stress that comes with flying stems from your sense of hearing being bombarded by low-frequency engine noise - among other things like the baby crying from a few rows back or a noisy group of tourists who surround you. All part and parcel of modern flying. Anyone who flies on a regular basis should invest in a good pair of noise-cancelling (NC) headphones. For a long time, the Bose Quietcomfort series have been the gold standard of NC performance that spares your sense of hearing from being bombarded. Ever since I bought my very first pair of Bose QC15s, I’ve never jumped on a flight without a pair of NC headphones. No other company’s NC technology has performed close to Bose’s until Sony released the MDR-1000X a few years back. Since then, they’ve released their second generation of products, including the WH-1000XM2 (a slightly improved version of the MDR-1000X), the “true wireless” in each ear WF-1000X and the “Behind-Neck In Ear” WI-1000X. I already had the Bose QC35 and the Sony MDR-1000X over-ear NC headphones in my collection before I bought the WI-1000X. Both over-ear headphones are great for long haul flights exceeding 8 - 9 hours. For flights shorter than that, having a pair of headphones occupy that much real estate in your carry on seems like a bit of a luxury. The Sony WF-1000X’s looks like a dream but its inability to connect to an inflight entertainment system (IFES) and short battery life ruled it out of the contest. The WI-1000X doesn’t suffer from these issues with its battery life of 10 hours on Bluetooth and 14 hours when connecting it by a (rather peculiar) Micro USB to 3.5mm headphone plug. Most of the reviews on the WI-1000X online don’t focus on in-context use, which got me thinking for a while before I decided to take a plunge on them during an Amazon sale. (They’re on sale frequently, including at this time of writing). I really like the amount of thought Sony has put into their packaging for their high-end headphones. There’s a separate black box within the packaging with a Sony logo printed on the front. I’ve reused many of these boxes over the years as they seem to have been designed to be recycled. I must point out that the bundle of earbuds is extremely generous. 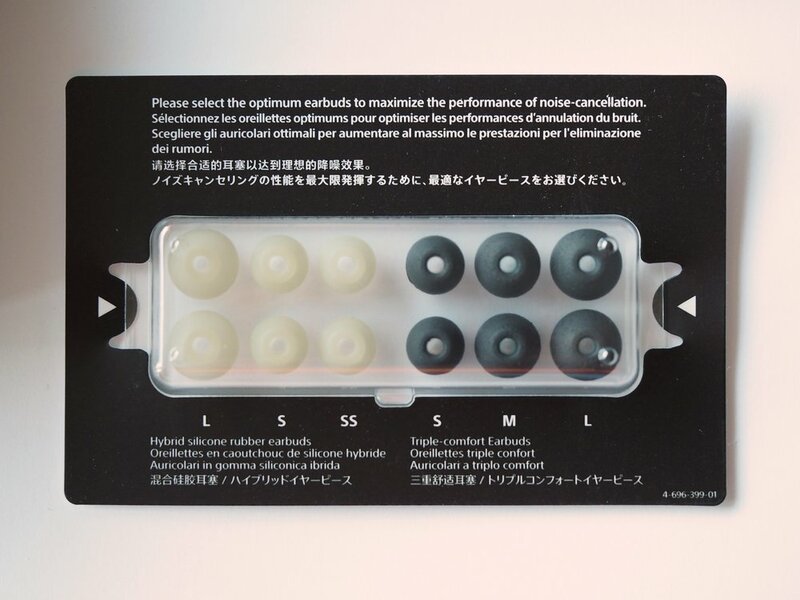 Not only do you get Sony’s excellent Silicone Hybrid earbuds in 4 sizes, they throw in the more expensive Triple Comfort earbuds in 3 sizes as well. Sony’s Triple Comfort earbuds are an interesting combination of foam and silicone that are definitely worth a try. I tend to prefer the Silicone Hybrid earbuds on these as they form an airtight seal on my ears, but YMMV. I’ll get to the point. Get a replacement inflight adapter from Bose and throw away the ones bundled by Sony. (In this case, I only put a link to Amazon for illustrative purposes, be sure to order one from the Bose Service Centre in your area for the best price). The Bose adapter includes a built in volume reduction system that prevents extremely loud PA announcements deafening you mid flight. Even the flight adapter that came with my UE TripleFi ages ago included this feature. The ones included with Sony feel like a cheap $1 model that you get off eBay. They are just not worthy of these headphones and are probably the only weak point in this bundle. The WI-1000X feels premium all around. There are detailed accents all around and the brushed aluminium back gives a premium feel. A grippy textured finish graces the inside of the band, preventing the device from going lopsided when walking about. The section that touches the back of the neck features a soft pleather cushion like in high end headphones. Honestly I think this was a bit overkill, given the device’s light weight - but still a very nice touch nevertheless. Even the cables seem to have been designed to prevent the In-ear pieces from rotating. If you’ve used older “Behind-neck” headphones before such as the Sony SBH-80, then you’ll know how frustrating it is when you have an earpiece that has rotated out of place to the extent that the short wire connected to it either sticks out into your field of view or is constantly rubbing against your cheek. None of that with the WI-1000X! As for in-ear comfort, I’ve worn them straight during a 9 hour flight with some fatigue only setting in towards the end of the 8 hour mark. Sony’s hybrid silicone and triple comfort earbuds are widely known for their comfort, so it’s highly likely that you’ll find these as comfortable as any other in-earbuds out there. Bluetooth codecs include SBC, AAC, LDAC and aptx-HD. Pretty much all of the codecs you need in 2018. DSEE HX is a proprietary technology that upscales low-resolution music files. The implementation of DSEE HX here is not as potent as the one on my Walkman ZX300, so take it with a pinch of salt. Sony’s Headphones Connect app allows you to access some additional features and update its firmware. Something that has been missing from previous generations of Sony’s Bluetooth headphones. There’s a Noise Cancelling Optimizer that can detect background noise and atmospheric pressure to fine tune NC properties. I found that it detects atmospheric pressure pretty accurately. Triggering it while cruising at 37,000ft yields an optimisation parameter of 0.8atm and reduces the NC pressure on your eardrums. Noise Cancelling modes include On (default), Ambient Sound and Off. I only use it with NC on. While Ambient sound lets some of the “important” sounds in like announcements, I’ve found it disorienting. Vibration for incoming calls. I never have this around my neck all the time so it’s not a big deal for me. I find it frustrating that there is no haptic feedback when it’s being switched on/off though. Built in microphone is poor at picking up your voice, don’t even bother. Some gimmicky features like sound position control and venue virtualisation can be triggered through the app, I’m not sure why anyone would use this. A 5 point equaliser is available through the app, with an additional bass clarity control. I usually leave this off but good to know that it’s available. Audio quality is a very subjective experience, so I’ll try to explain my experiences with the WI-1000X in the various contexts. Hardware-wise though, the In-ear headphones use the same hybrid design as many of Sony’s recent higher end earphones. The hybrid system consists of a balanced armature driver that takes care of the higher end frequency sounds and a dynamic driver that takes care of the mid-range and lower frequency sounds. I have another pair of high end Sony earphones, the excellent XBA-N3 that uses this configuration and I can tell you that it delivers very well in terms of clarity and soundstage. I’ve used the WI-1000X on multiple 3.5 hour flights between Singapore and Hong Kong, and also a lengthier 9 hour haul between Hong Kong and Brisbane. During these tests, I felt that the level of noise cancelling was on par with that of the QC35 and MDR-1000X. This is a pretty great result considering its size. Clarity and soundstage on music are movies are excellent for a pair of In-ear headphones. I was especially impressed with how the soundstage felt as expansive as some of my over-ear headphones. The only time I got annoyed was when the inflight adapter did not reduce the overly loud announcements that came from the PA system via the IFES connection. Noise cancelling is fantastic on subway trains and buses. It kills most (if not all) of low frequency background noise and conversations when music is playing. I tend to listen to spoken word audio when commuting, so the Apple AirPods will still be my primary listening device. But when I feel like listening to some tunes instead, the WI-1000X will come on. Unsurprisingly, audio quality is best when you’re seated in the office. The noise cancelling kills off most of the chatter and background noise around you. The WI-1000X can pair with multiple devices, but can only connect to one device at any given time. This will be a step back from the QC35 (which can connect to two simultaneously). Switching between connections is also more time consuming, requiring you to power off the device, power on in pair mode, then connecting to the device from the Bluetooth settings menu on your other device. I don’t understand why Sony cannot copy Bose’s superb implementation on the QC35 - where pressing the power button makes the headphone read the name of the next device on the list it will connect to. Range is really great and its resilience against interference is better than the AirPods. I didn’t encounter dropouts where I normally do in Hong Kong. This device supports Sony’s LDAC codec for Bluetooth streaming. I tested this with my Sony NW-ZX300 Walkman and the difference sound quality was noticeable when compared to the SBC codec. The clarity in the separation of instruments and soundstage was noticeably improved using LDAC. It’s not a replacement for the cable though, as the difference in sound quality between LDAC and a wired connection is even more noticeable. Range is terrible with LDAC however, and the slightest bit of interference will cause dropouts. I find LDAC unusable when walking around in public. They will also complement larger headphones already in your arsenal like the Bose QC35 or the Sony WH-1000XM2 perfectly as they take up way less space in your bag. The only downsides I see are the poor bundled in-flight adapter (easily replaceable) and the poor mic quality. If neither of these bother you, you should really consider giving one a go on Amazon.